After the failed theatrical reboot Shadow Recruit starring Chris Pine in 2014, Amazon is reviving the Jack Ryan franchise with a new TV series. The streaming service has given a 10-episode straight-to-series order for the espionage thriller, with The Office star John Krasinski taking the lead this time out. He'll play the extremely popular CIA hero in a drama that is coming from former Lost duo Carlton Cuse and Graham Roland. Michael Bay's Platinum Dunes, Skydance Media and Paramount TV brought Jack Ryan to Amazon this past April, where it was given a series commitment. Amazon ordered three scripts at that time, all of which were written by Cuse and Roland. Together, they developed the pilot for this new take on Tom Clancy's titular hero. They then finished the three scripts, which have set the stage for the entire first season. This version of Jack Ryan will be a reboot that gives the character a modern sensability. The show follows Krasinski's Jack Ryan as an up-and-coming CIA analyst who uncovers a new pattern in terrorist communications. According to Deadline, Ryan will be launched into the center of a dangerous cat and mouse game, pitted against a new breed of terrorist that threatens mass destruction on a global scale. Paramount TV and Skydance TV will co-produce alongside executive producers Cuse, Roland, along with Platinum Dunes' Michael Bay, Brad Fuller, and Andrew Form. Also coming along for this thrill ride are Skydance's David Ellison, Dana Goldberg and Marcy Ross. Producer of the movie franchise Mace Neufeld is also aboard, along with Lindsey Springer of Carlton Cuse Prods. 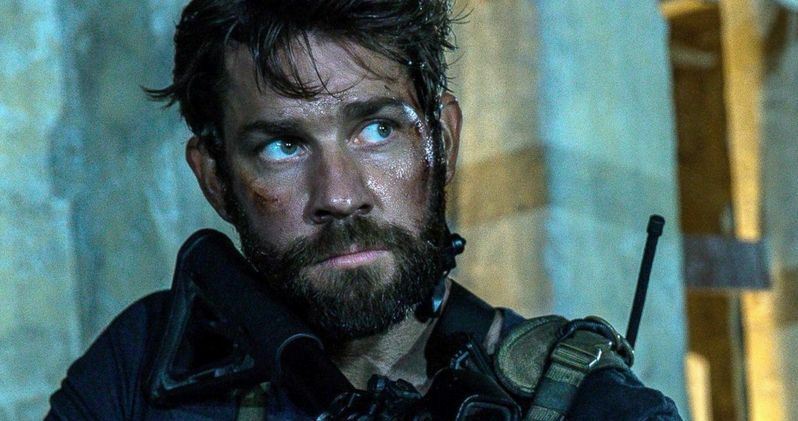 This new Jack Ryan TV show once again reunites John Krasinski with Michael Bay. The actor starred in Bay's directorial effort 13 Hours: The Secret Soldiers of Benghazi, which opened this past January. The show is set to shoot across the world, with stops in the US, Europe and Africa planned thus far. Krasinski is the fifth actor to take on the role of Jack Ryan over the past two decades. The franchise kicked off in 1990 with The Hunt for Red October, which starred Alec Bladwin in the lead. Also tackling the character have been Harrison Ford, Ben Affleck, and the aforementioned Chris Pine. Jack Ryan is just one of several shows at Amazon that have skipped the pilot stage of production, including the new Woody Allen comedy drama Crisis In Six Scenes and David E. Kelley's Goliath. The show marks Paramount TV's 7th show currently on the air, with it joining Maniac and 13 Reasons Why on Netflix, School Of Rock at Nickelodeon, The Alienist at TNT, Berlin Station at EPIX; and Shooter at USA. At this time, Jack Ryan does not have a set premiere date, but we expect it will premiere in early 2017 if not sooner.